Kevin Felderhoff was born and raised in Muenster, Texas and earned a BS of Industrial Technology with an emphasis in Construction Management from Texas State University in San Marcos Texas. He has lived in Birmingham, Alabama; Brevard, North Carolina and currently lives in Taylors, South Carolina and turns for a hobby. Kevin’s love for building things and working with wood began in his high school years. He was fortunate to have an awesome shop teacher who taught him great wood working techniques. 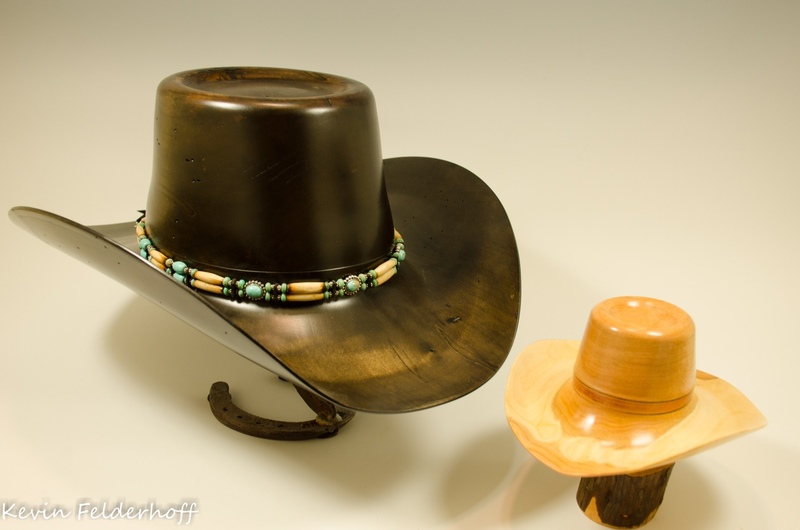 While in Alabama, a colleague introduced him to woodturning and Kevin quickly became involved with the Alabama Woodturners and in fact was elected President in 2009. He began turning on a Rikon Mini Lathe in 2007 and currently is turning on a Powermatic 3520B. Living in the mountains of North Carolina, Kevin had the opportunity to participate in numerous exhibitions and demonstrations. Fallen wood was prevalent and provided opportunities to challenge and grow his analytical and artistic mind. It was satisfying to Kevin to rescue a gnarly piece of wood and transform it to an exquisite piece of unique art. Turning for Kevin is stimulating and mentally challenging to analyze the rescued wood and calculate the best angle to mount the wood on the lathe. Being a native of Texas, it was natural for him to want to turn something “Texas” from wood so…. 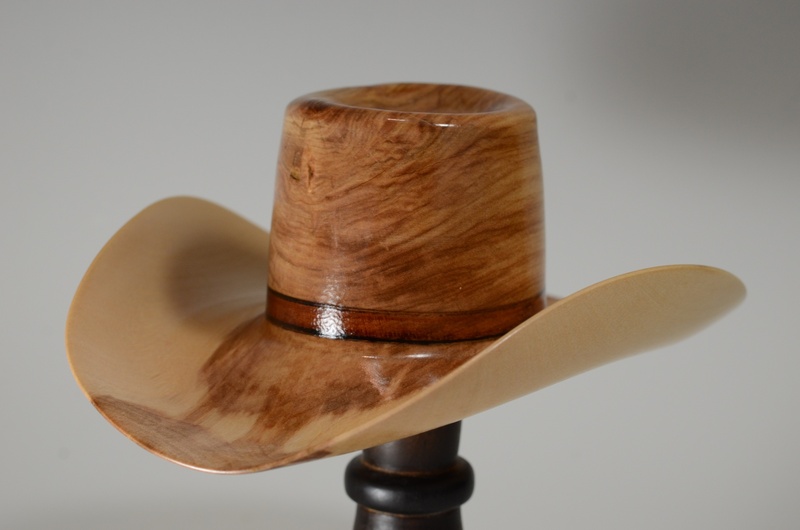 nothing better than a Wood Turned Cowboy Hat. 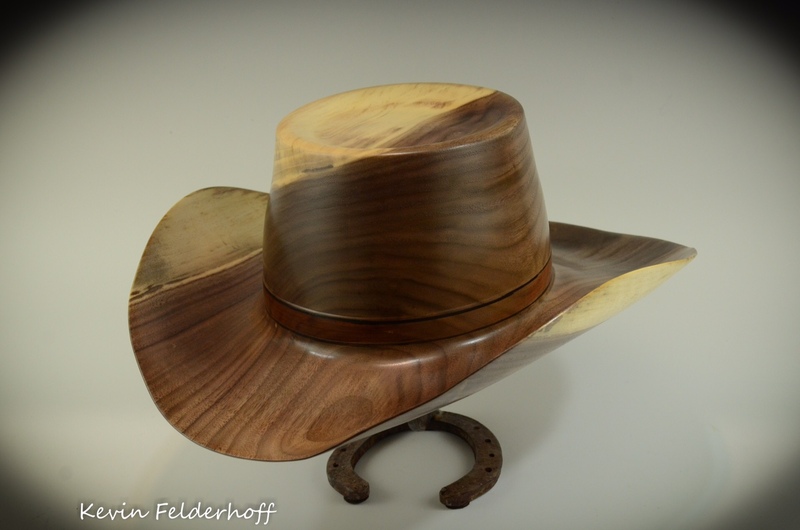 While in Brevard, North Carolina Kevin was mentored by a local woodturner, Nick Neiley and watched Johannes Michelsen DVD on how to make a wood turned cowboy hat.